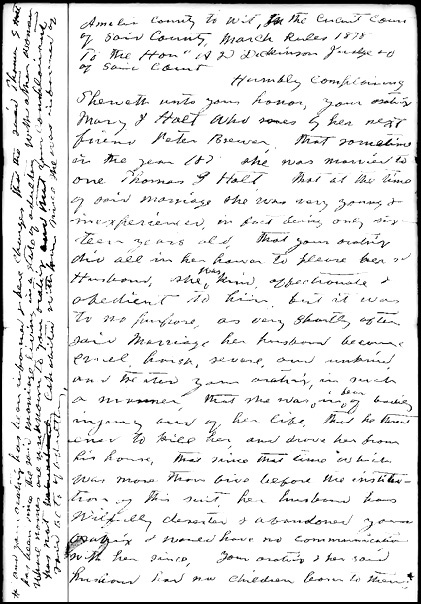 In February 1878, Mary Jane Holt of Amelia County, Virginia, decided that she’d had enough. 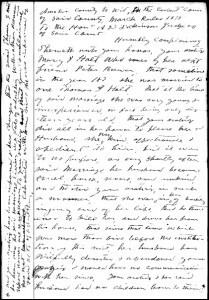 As a young teenager, she had married Thomas G. Holt in Amelia County on 10 July 1871.1 She later said she’d been 16 at the time of the marriage,2 but the records tell a different story. What in the world is an oratrix? Okay, so we know from the –ix ending that this is going to turn out to be the female version of the word orator applied to men. That doesn’t help a whole lot, does it? It turns out that oratrix, or the male version orator, is a word in a legal document that provides a very big clue to the type of case it is — and to the type of court that’s deciding it. In plain English, the law courts had to follow very strict rules of pleading, and they had limited remedies. Usually, if you sued at law, you wanted money damages. Equity courts had the power to look at fairness and to provide “a specific and preventive remedy … where courts of common law only give subsequent damages.”18 So if, for example, you wanted out of a marriage, you went to the equity court — the chancery court. So when, in an old legal document, you see the complaining party referred to as an oratrix (or an orator), think chancery court, not law court. And think some kind of specific relief rather than just money damages. That may point the way to where the records are, and understanding what’s going on in the case. Fascinating – I had to get side-tracked totally from what I was trying to do and look up the history of the Chancery court in England, then looked up details for the USA – and found this current advertisement for clerkships in the Delaware Court of Chancery: http://courts.delaware.gov/chancery/ Very interesting information once more, Judy. Cheers. Thanks as always, I learn something every time I visit here. I always learn something new from your blogs. And learning something new is always one of my daily goals . So glad it’s proving helpful!